Bonjour! It is a gorgeous sunny day and the birds are chirping out melodies of joy. Today I am excited to share my cooking lesson with you. 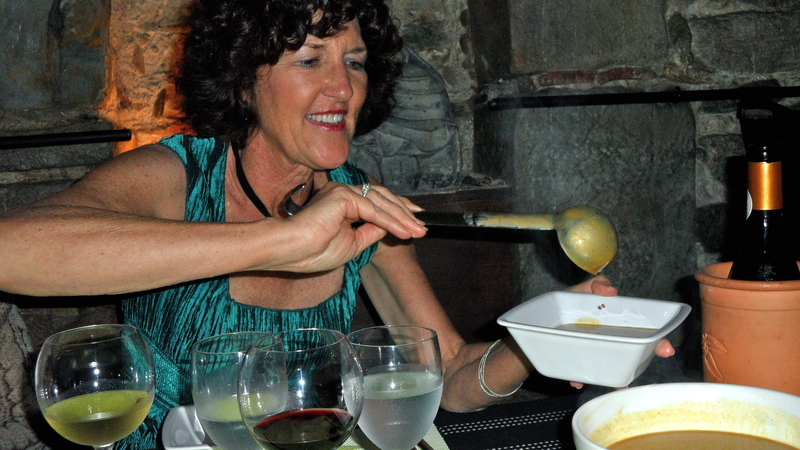 As you know, we four women ate at Le Sixieme Sens earlier in the week and were charmed by the “cave” experience and the owner, Lionel. He invited us back and said he would cook anything for us, perhaps a French recipe we had never tried before. 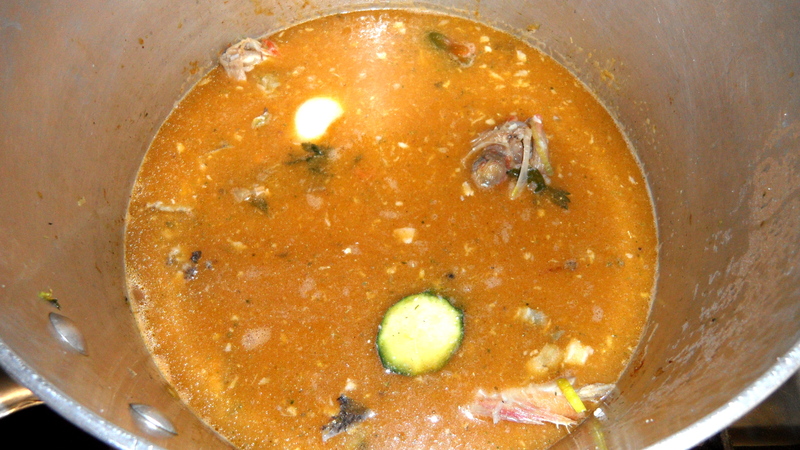 We put our heads together, looked through some cookbooks and came up with Bourride, a type of fish soup. I emailed him our choice and on a second thought, asked if I might watch the process. The reply was “oui” and could I be there at 2pm? Of course! I walked into the restaurant, and Lionel did not waste any time handing me an apron and asking me to please slice the fennel and leeks he had cleaned and organized on a cutting board. I was thrilled. Not only could I watch, I would be his sous chef for this recipe! I washed my hands and quickly got to work in his pristine kitchen. He asks me how I chose the recipe for Bourride. I reply that it is something you would not find on a menu in the States and I could smell the melange of flavors in my mind. He comments that it is an ancient recipe, one that your grandmother would have made. The recipe for Bourride is in Lionel’s head and ingredient after ingredient appears from a small refrigerator below the counter. 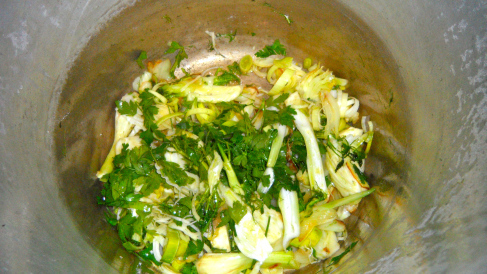 Into a giant, maybe three gallon stockpot, we toss leeks, fennel, onion, parsley, garlic. 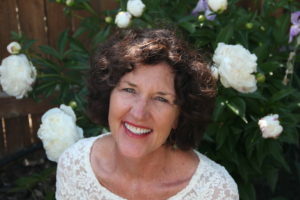 I will write out a rough recipe to share on a separate page to this post. Next we add a cupful of cherry tomatoes which he says have better taste than the larger whole tomatoes. “Now you can stir the pot.” The vegetable sweat as we continue to add a tube of tomato concentrate, generous sprinklings of pepper and sel gris (gray salt) which has more depth than regular salt. As we cook, I try to extract as much as I can about this man in my beginner French. 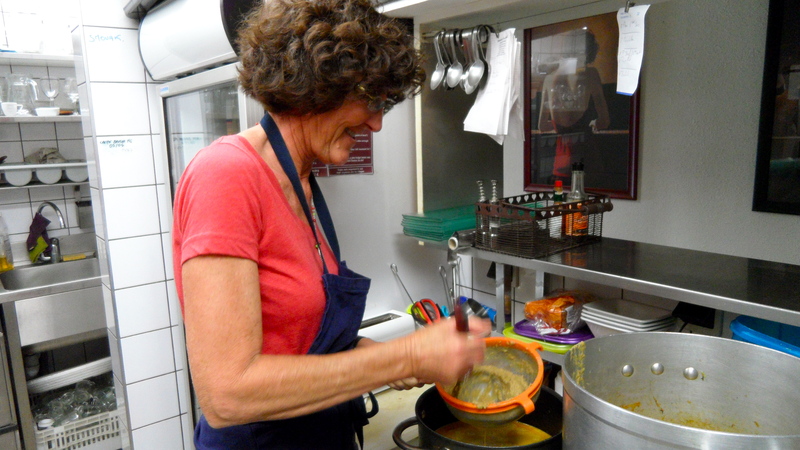 Lionel’s mother is a passionate cook who prepared international dishes for the family. This influence and appreciation for food led him to experiment with different recipes while DJ’ing in St. Etienne for 14 years. Six years ago he came to Carcassonne to realize his dream, opening Le Sixieme Sens, appropriately named because he creates the taste and smell for your six senses. He manages the kitchen by himself and enthusiastically cooks for his guests. 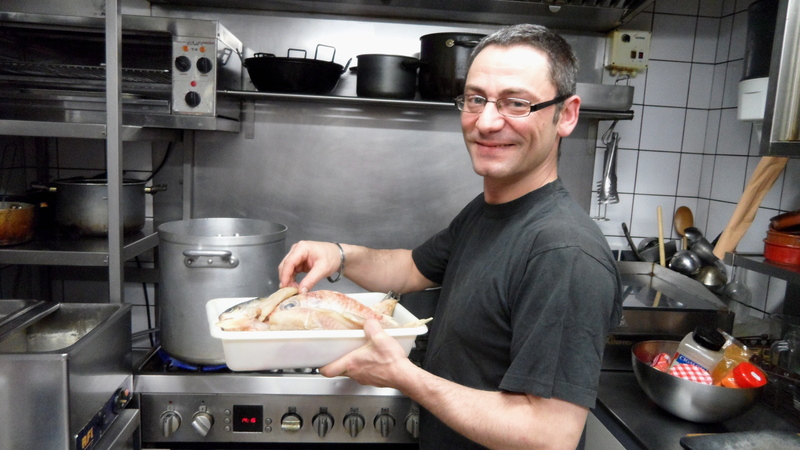 Back to the Bourride – into the pot goes whole fish, eyeballs and all. Poisson Roche, a kind of rock fish and Lotte. Next a handful of thyme and tumeric and a few quarts of water. This all simmers for three hours. A rouille is the traditional accompaniment for the dish so we begin with fresh, homemade mayonnaise to which I add finely chopped garlic, salt, pepper, turmeric and a tiny dash of hot pepper sauce. We reserve this for the dinner tonight. Lionel asks, can I return at 6 pm to finish the soup? Ma oiu! 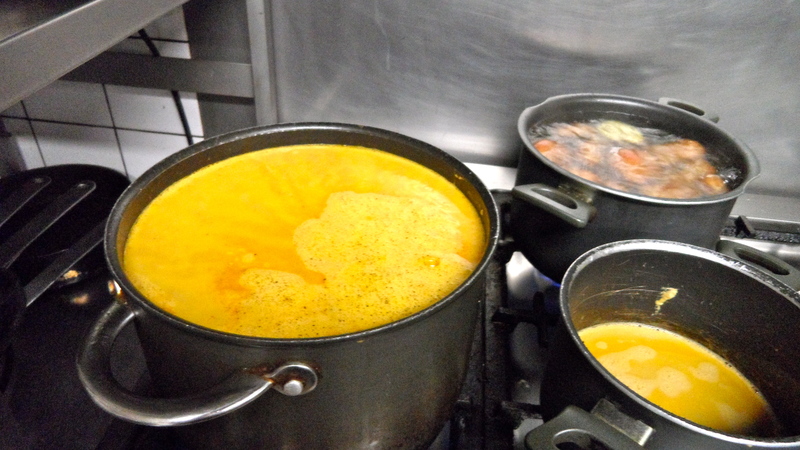 The next step in this lengthy process is to strain the gallons of fish broth we prepared earlier into another stock pot. 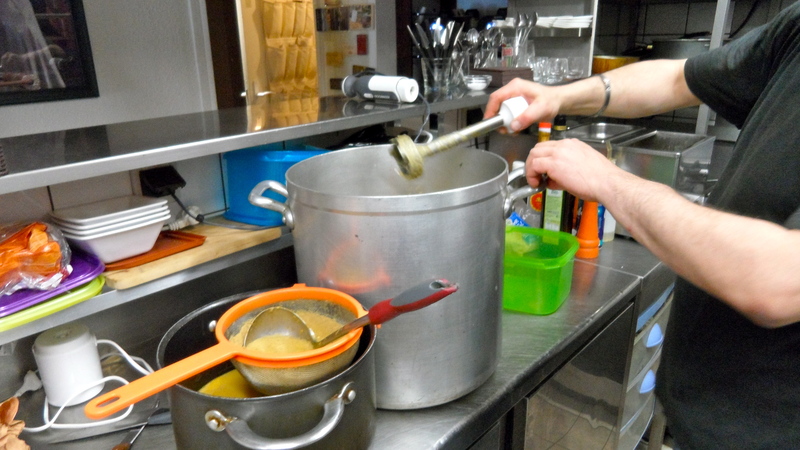 First Lionel uses a hand processor to blend all the simmered ingredients together. Ok, I am game and in this steamy kitchen I sweat as I ladle spoonfuls after spoonfuls of broth into this small strainer. First course is the delicious soup, so creamy with gentle fish flavors and a hint of the fennel and leek. 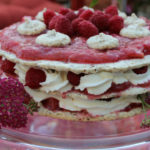 I had never tasted such depth and richness without the help of cream and butter. Served with toasted baguettes and the garlicky rouille, it exceeds my expectations. 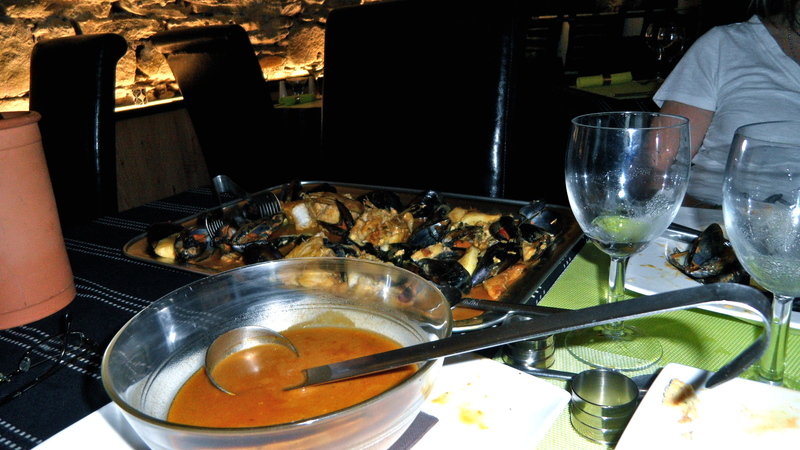 After the first course of soup, Lionel gently poaches fresh fish of lotte, loup, meurlu, squid and calamari. This second course is served separately on a giant platter, enough food for 10 people! 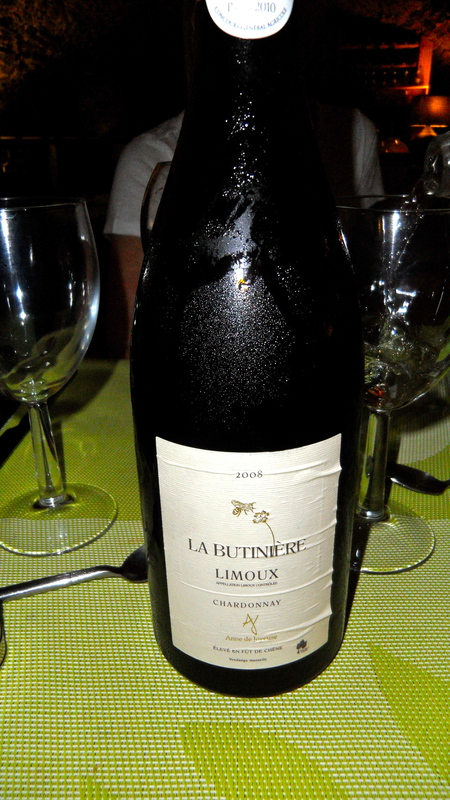 This chardonnay from Limoux, a local wine growing region paired perfectly with the Bourride. Merci Lionel for a very memorable experience. I enjoyed every minute of cooking and learning with you! Good luck with your new tapas bar in fall.